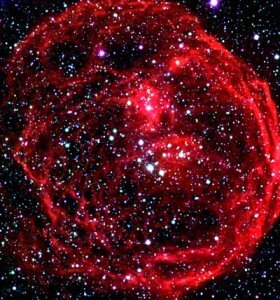 N70 (also known as Henize 70 and DEM301): a superbubble located in the Large Magellanic Cloud and measuring about 300 light-years across. A superbubble is a large cavity in the interstellar medium created by the explosion of several supernovae in the same region of space, typically belonging to the same OB association. Because the lifetimes of massive O and B stars is measured in only tens of millions of years, after one supernova has swept clear a bubble around itself, there isn't enough time for the interstellar medium to back-fill the cavity before other stars explode in the same region. Each subsequent supernova will rejuvenate the cavity left by the previous ones, causing the formation of a superbubble with a diameter of 150 to 300 light-years or more. The superbubble interior may be quite irregular, containing high velocity filaments moving chaotically, as seen in the Vela-Puppis region. Other prominent superbubbles in the Milky Way are those surrounding the Cygnus OB1 association, the Aquila supershell, and the Monogem Ring. Several superbubbles, surround OB associations in the Large Magellanic Cloud; these include the N70 superbubble (shown here) and the N44 superbubble. In fact, most supernova remnants (SNRs) are likely to be found in superbubbles, but it may be difficult to identify the old ones individually because they have merged with other old SNRs. We can only be sure to see the young ones, which are still interacting with circumstellar gas expelled by their progenitors.